Monkhouse Hill Cottages016974 76254work Self-cateringA stunning collection of nine cottages in an undiscovered part of North Lakeland, each with their own distinctive ‘Contemporary Cumbrian’ style, offering a unique range of holiday extras. Twice winner of Cumbria Tourism’s 'Self Catering Holiday of the Year', Visit Britain Gold Award held for all cottages and holder of the Green Tourism Gold Award. Romantic cottages for couples with four posters or canopied beds, log burning stoves and spa baths or sauna suites. Also a special Lake District honeymoon package including spa treatment, champagne, chocolates and fresh flowers. 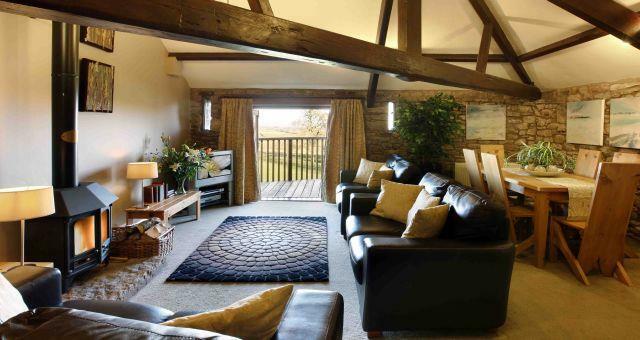 Spacious cottages for families or couples with log burning stoves, balconies with private outside hot tubs, and open plan living areas with oak beamed roofs. Plus a wide range of family orientated extras - from backpacks and bikes to toy boxes and playpens. Larger cottages for groups, designed especially for two or three families holidaying together, with large living spaces and dining areas and private spa facilities. Quality local catering service and local beers available for any size of group celebration. Set around a courtyard in five acres of landscaped grounds, with an outdoor play area and games room on site. Also free access to the superb North Lakes Spa leisure facility in Penrith. Monkhouse Hill Cottages offers weekly bookings starting on Friday and sometimes short breaks. Includes electricity, hot water, central heating, linen, towels, Spa membership and VAT (at 20.0%). Weekly bookings from Friday. All cottages are nonsmoking. Raven Howe offers weekly bookings starting on Friday and sometimes short breaks. Round Knott offers weekly bookings starting on Friday and sometimes short breaks. 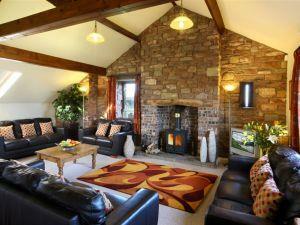 The Laing Barn offers weekly bookings starting on Friday and sometimes short breaks. A stunning collection of nine cottages in an undiscovered part of North Lakeland, each with their own distinctive ‘Contemporary Cumbrian’ style, offering a unique range of holiday extras. Fishing and pony trekking nearby. Leisure facilities are at North Lakes Spa in Penrith 15 minutes away, facilities include swimming and gym. Children welcome from any age. Straightforward directions can be obtained from the 'find us' page of our website. Do not use postcode based 'satnav' as you approach Monkhouse Hill - this will lead you up a nearby fell!